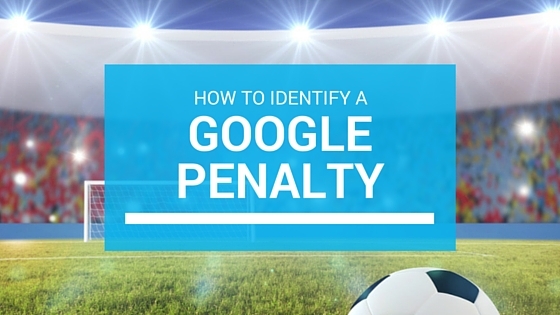 How to Identify a Google Penalty? To continually provide users with the best possible results for their search queries, Google updates its search engine algorithms around 500 to 600 times a year. The majority of these updates serve minor functions and may not affect your website whatsoever; occasionally, however, Google will release a major algorithmic update, such as Google Panda and Google Penguin. These updates have the potential to disrupt the traffic and rankings of certain websites and pages, and may even get a site hit with a Google Penalty de-indexed. If your website or the site you’re working on suffered a sudden drop in traffic and rankings (and frankly, you’re stumped as to why), you may want to see if the drop correlates with a Google algorithm update. Fact is, your site’s sharp downfall may be due to a Google penalty. Back in the black hat SEO days, if you wanted a search engine to find your page for the term “antique chairs,” for instance, you could maybe get away with stuffing “antique chairs” all across your website. Today, you won’t easily find many keyword stuffed pages. Google is adamant about providing users with high-quality websites, and, therefore, the search engine penalises sites for a number of reasons, including everything from keyword stuffing to unnatural backlinks from unrelated domains and over-optimised anchor text profiles. Other factors that could lead to a penalty include spam and user-generated spam, excessive website downtime, content farming, duplicate content, and more. Manual Action — If Google suspects violations of its Webmaster rules, it may manually penalise your website. You can lift the penalties by repairing the website and submitting your website for Google review. Algorithmic Action — Major algorithmic changes, such as Penguin or Panda, can negatively affect the search rankings of a website, even to the point of deindexing the site. Generally, these changes are Google’s way of filtering out non-optimal results for search queries. Fortunately, you can confront both types of penalties and make the appropriate changes to your site, and it all starts with identifying the Google penalty either manually or by using a Google penalty checker. When Google takes manual action on a website, it will notify the site’s owner through the Google Webmaster Tools. If you don’t already use Google Webmaster Tools, you can easily implement it through Google Analytics. Simply sign into your account and add your website to Google Webmaster Tools. Verify site ownership through your Google Analytics code. After entering your Google Webmaster Tools Account, go to the “Search Results” -> “Manual Actions” section. If Google has imposed a manual penalty, you should find a brief alert indicating a manual action penalty. In most cases, you can find a brief note explaining the nature of the penalty as well as the affected web page. NOT ALL manual actions will negatively affect your site’s organic search traffic and rankings. Some actions may affect the entire site, and others may affect pages that you no longer care about or are no longer generating revenue. For the latter, it may be best to rectify the penalty by simply deleting the affected web page. Check the date of the manual action and compare your organic search traffic before and after the action. Also consider using the “compare to” feature to analyse data over a longer period of time. This feature is located in the upper right hand corner (click on the date range) of the Audience Overview page, the Acquisition Overview page, or any other data set you wish to compare. Look for sudden drops in search engine rankings, conversions, organic traffic, etc. Manual action penalties are regarded as the most difficult to fix but refreshingly simple to identify. To fully repair these issues and avoid further penalties, for now and the future, it can be helpful to contact a Google penalties expert. 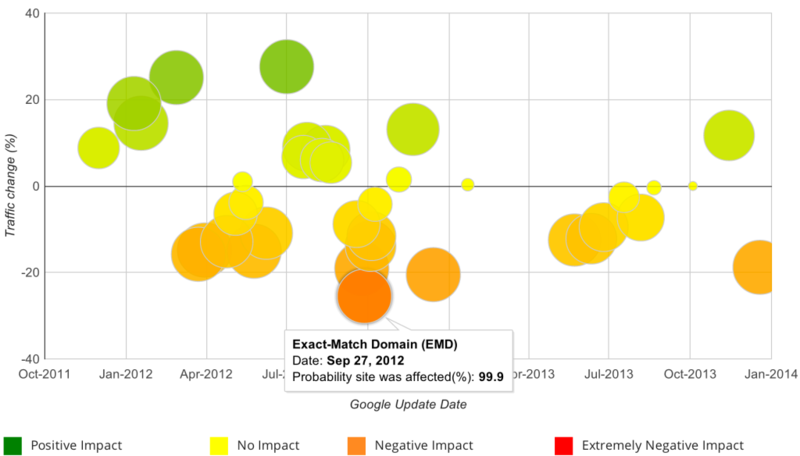 Today, Google will most likely update their algorithm at least once. As I mentioned earlier, Google makes updates about 500 to 600 times a year, and most of these updates are quite small and shouldn’t drastically affect your website. Bigger updates that could affect your website, however, are often publicised to give website owners the chance to avoid potential forthcoming penalties. The most common penalty comes from the Panda Algorithm Updates, which focus on quality content on your site or individual pages. If the algorithm detects low-quality content, Google will assign a lower quality score to your website. The second most common type comes from the Penguin Algorithm Updates, which mostly affects website owners engaged in aggressive link building campaigns. If the algorithm determines that you’re trying to manipulate search rankings through unnatural link building, Google will penalise the site for the keyword or group of keywords you’re targeting. Algorithmic penalties do not show up under manual actions in your Webmaster Tools. As such, identifying these penalties can be a little more complex. Similar to identifying manual actions, you can find the release date for these larger algorithmic updates and compare data in Google Analytics before and after the release. If you cannot correlate a Penguin or Panda update with a data drop, there are a few methods to pinpoint the problem. If you have Google Analytics, one of the most well-known Google penalty checker tools is the Fruition tool. Although this is a paid tool, you can still use it for one or two properties in your Google Analytics account. In short, the Fruition tool will analyse the website’s data over time with known Google updates. The cross-checks are then organised into a colourful graph full of green, orange, yellow, and red circles. Additionally, you’ll have a list of updates by date and the impact that the update may have caused on your website. For instance, by looking at the data you notice that, on November 13, there was an unconfirmed algorithm update that had a 95 per cent negative impact on your site. You should always take these notes with a grain of salt, but it is a good indicator of where to look next. If you don’t have access to Google Analytics, the FEInternational Website Penalty Indicator is a great source for identifying possible penalties. Once you have identified the algorithmic update and the potential impact, one of the next steps is to determine the essence of the update. For instance, for a Penguin update, you may want to check the anchor text of your site for unnatural links, over-optimisation, and so forth. Majestic SEO’s Site Explorer is one of the most convenient tools for finding all sorts of information about your website, including anchor text. By using this tool, if you see that distribution for your site’s anchor text heavily focuses on a single keyword, you may have an over-optimised anchor text profile that has been hit by the Google Penguin update. Identifying the penalty, whether manual or algorithmic based, is the most difficult part of the process. Nonetheless, by analysing and identifying through your Webmaster Tools or a Google penalty checker, you can better isolate the cause of the issue and how to solve it. As I mentioned earlier, some penalties may require a quick fix (delete a page that is no longer serving your business, stop linking every instance of your brand or service, etc). Other penalties, especially unnatural link penalties, for example, require a finesse to quickly and efficiently remove the penalty and get your business or website ranking well once again. At Only Way Online, we offer a full-service Google Penalty analysis and correction, and we’ll completely isolate how specific penalties occurred in order to take corrective measures. Moreover, we’ll conduct a full website audit to help prevent penalties, whether from smaller algorithmic changes or Google’s latest Penguin update, for instance. It is important to not be reactive to Google. If you depend on Google for a portion of your website traffic, you can take control of your site by having an audit as well as expert opinion for avoiding penalties and increasing your presence in search results. We can assist with identifying and correcting issues before you’re hit with a Google penalty, and, consequently, these techniques can help increase your website ranking and traffic. Start building a better website and brand today with Only Way Online.